1 Cup Gluten Free Pretzels( check the labels on all processed foods, even if it is gluten free, they are still adding cellulose to some of it. I did find it in one brand of GF pretzels) I used Great Value Brand for this, it does not celloulose! In large microwavable bowl mix cereal, crackers, pretzels, and nuts. In small glass bowl or glass measuring cup add butter, honey and barbeque sauce. Melt in microwave for 1 – 1 minute 30 seconds, or until butter is completely melted and mixture is bubbling. Remove sauce from microwave and stir. Then slowly drizzle sauce over cereal mixture, stopping to stir cereal as you drizzle. When you have used all of the sauce and cereal is completely covered, microwave for 4 minutes, stopping to stir every minute. When done spread mixture out onto counter or cookie sheet covered with parchment paper to cool. Do not use paper towels, the sauce is just sticky enough to stick to the paper towels. You will need to break it apart once it is cool and store in an air tight container, or serve. 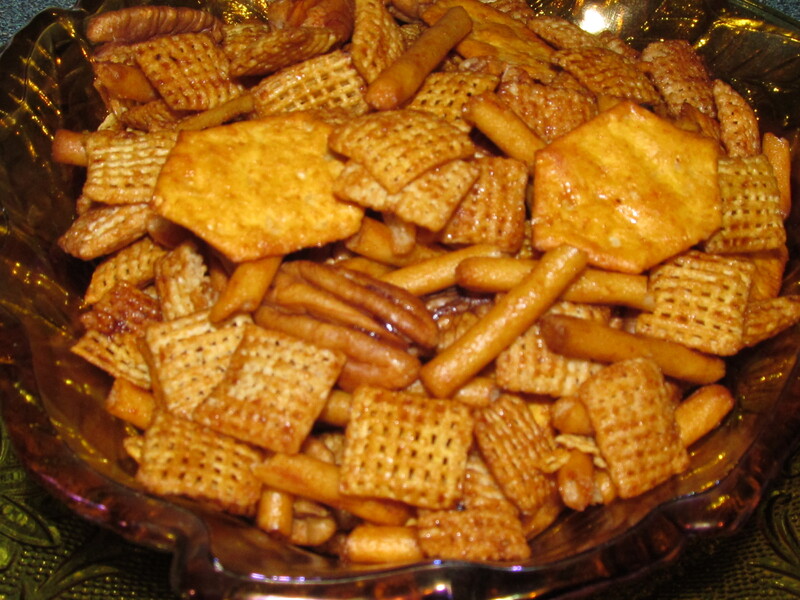 I like to make a batch of the original chex party mix, using the same Gluten Free cereal, crackers, and pretzels, then once cool serve them together. I personally like to eat them together, but you may want yours separate.